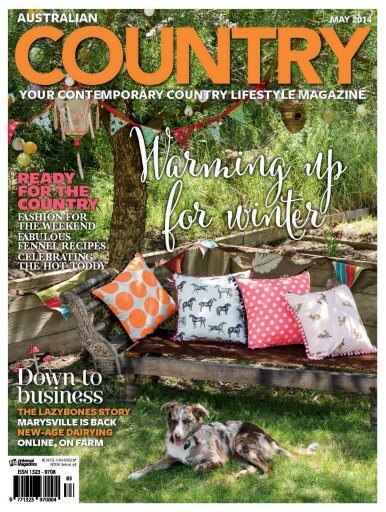 For the next issue of Australian Country we’ve once more traversed the country catching up with some extraordinary folk and their amazing homes and lifestyles. In Western Australia’s Margaret River we meet interior designer Jacquie McPhee and learn about her astonishing collection of Aboriginal art and we also visit artist Rebecca Cool and her sculptor husband, Ross Miller. Then we head to Victoria where Jo Anderson skips through life creating the most amazing vignettes and fairytales under glass. We also visit Marysville, the town devastated by the Black Saturday bushfires of 2009 and find that this beautiful tourist town is gradually rebuilding and ready for visitors. In NSW we go to the Byron Bay hinterland home and studio of Tracey Hocking, designer behind the delightfully retro Lazybones label. Plus we meet profile an extraordinary weekend getaway at Goolwa, South Australia’s river port near the mouth of the Murray. Stylist Sandra Hinton embraces the cooler weather with her setting the scene story that celebrates the hot toddy, while our service feature explores all the wonderful heating options that are available for the cooler months. We love people who think outside the square and we’re sure you will enjoy our feature about the Van Donk family of Victoria who have joined the Green Pastures collective of sustainable dairy farmers.